With rest of India “Swachhata Hi Seva” campaign launched all over Arunachal pradesh . Palin: To commemorate the 4th anniversary of Swachh Bharat Mission, the fortnight long “Swachhata Hi Seva” campaign launched at Yaglung village under Palin Circle in Kra Daadi District by the District Administration in collaboration with PHE&WS and Urban development department. Er Likha Tekhi, EE PHE&WS and Er Patey Punung, DD UD & Housing briefed the gathering about the campaign and advocate for cleanliness in households, schools, health centres, water bodies, public places like office, market and etc. Dr Higio Tama, DMO also spoke about maintaining hygiene in the surrounding and water bodies in order to protect us from various diseases. Seppa : A fortnight-long sanitation programme as part of the nation-wide ‘Swachhata Hi Seva’ campaign was launched today in here in East Kameng district by Seppa West MLA, Mama Natung, at the Donyi Jyaling Nyele Namlo. Speaking at the launch event, Natung stressed on the need to practice safe sanitation in the district. He also appreciated the PHED for effective implementation of sanitation-related work and conducting awareness programmes involving stakeholders. Natung informed that Arunachal Pradesh is the only state which provides financial assistance of Rs 8,000 in addition to the central allocation of Rs 12,000 for construction of toilets in rural areas. Pasighat: Lets each of us contribute to make our Pasighat and whole of East Siang Clean and Green” said Local MLA Kaling Moyong today in the morning while launching Swachhata Hi Seva, 2018 , here in the presence of students, volunteers, Teachers, HoDs, PMA Office bearers, Officials at Daying Ering Memorial School(DEMS) “. Together we can make it happen to keep our City Clean, as service towards Cleanliness is the best tribute to the Father of the Nation , Mahatma Gandhi ” the MLA said ,adding that while Nature has bestowed natural beauty ,it is upon us to promote the cleanliness and hygiene of our City by keeping our surroundings, homes ,schools ,markets ,tourist places clean and take pride in making our Smart City and districts Clean and Green for its a people’s effort . 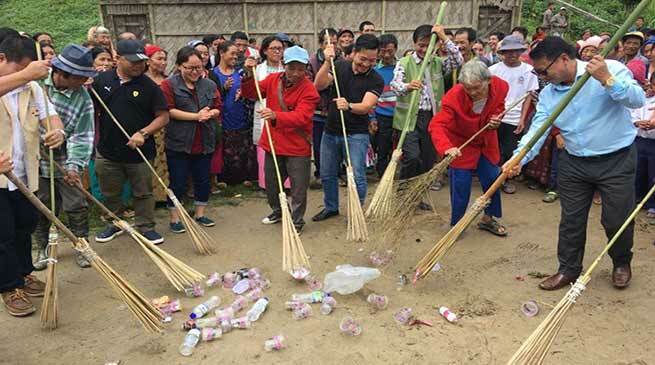 Along: with the rest of the nation, “Swachhata Hi Seva” Campaign was today kick started in Siang District as a precursor to the 150th Anniversary of Mahatma Gandhi and the 4th anniversary of the Swachh Bharat Mission. At Pangin, the programme was launched by Deputy Commissioner Siang District Rajeev Takuk in the presence of EE PHE & WS Subat Pertin, HoDs, admin officers, officials and staff from various departments, Public leaders, ex-PRI members, NGOs, teaching faculty and students from various schools and general public. Speaking on the Government’s efforts towards achieving a Clean India, the Deputy Commissioner in his address urged everyone to join the movement and work towards keeping their surroundings and toilets clean. Tezu: The formal launching of fortnightly long programme for celebration of “Swachhata Hi Seva”’ at Lohit District was launched today on 15th September 2018 by the Deputy Commissioner Lohit Karma Leki , at the Amik Ringya Hall Tezu. The program was attended by the SP Anini, all the administrative officers , HODs, officials, GBs, students and other participants. Speaking on the occasion Karma Leki, DC Tezu informed the gathering that the “Swachhta Hi Seva” campaign is being celebrated throughout the country as a precursor of 150th birth anniversary celebration of our father of the nation Mahatma Gandhi. He strongly advocated the need to inculcate the habit of personal hygiene in our daily life as “ Cleanliness is next to Godliness” as preached by our father of the nation .He reiterated the need to keep ones surrounding clean to lead a healthy life. Aalo: The Heads of offices led by DC and SP, officials from various departments, senior public leaders, representatives from sectors and Market Committees of thronged Aalo street at Nehru Chowk to take Swachhata Pledge administered by West Siang Deputy Commissioner Sode Potom today. This was a Shubharamb to week long “Swachhata Hi Seva” programme under the directive of govt. of India to fulfil the vision of Father of the nation, Mahatma Gandhi ji is vision of a Clean India. Addressing the gathering Sode Potom, Deputy Commissioner West Siang spelt out the broad objective behind launching week long campaign for cleanliness and exhorted all to spread the message of cleanliness to nook and corner of the district so that it is inculcated as habit for our people.